Thanksgiving is coming up quick and it's got me thinking about the concept of home. We've packed up the gear, put the camper in storage and have turned our attention to important matters like: what kind of stuffing should we make for Thanksgiving dinner? And: which of the five invitations should we accept for the holiday parties all held on the same day? It's a frantic, expensive, caloric time of year but what better way to keep your mind off of the lousy weather and short days? 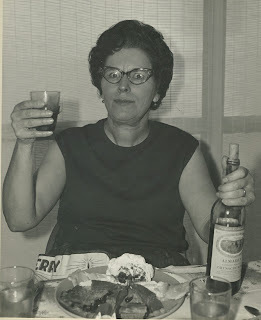 My Grandma Thelma, Christmas 1969. Did she know how to party or what? All of this excitement happens at or very near home: I still live in the town where I grew up, as does my whole immediate family (in fact I'm a fifth generation native.) This is how immobile I am: I live in the same house my father grew up in. Mark's family is all in the state, and most of them live within a few hours drive. We don't have to deal with plane tickets or extensive travel plans during the holidays like a lot of our friends. Though we both love to travel and are never unhappy in the new places we visit, we've never had the urge to move our home base. 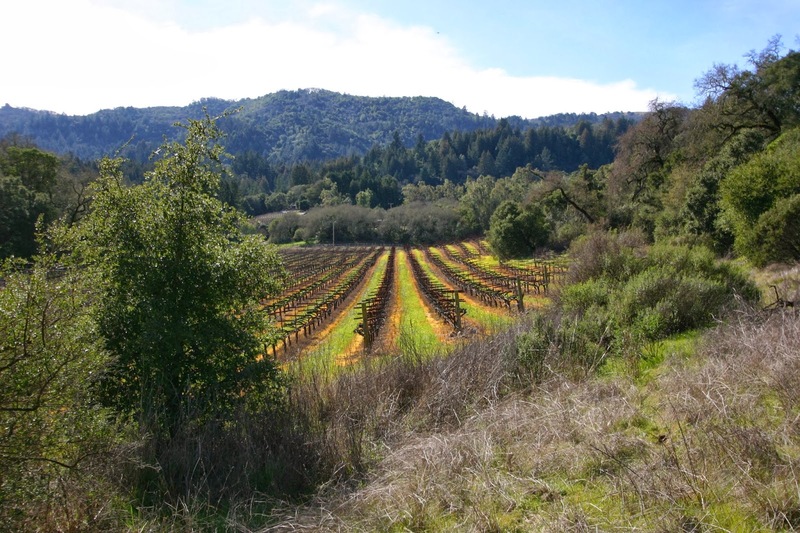 Of course it doesn't hurt that we live in a beautiful place with mild weather, close proximity to the ocean and mountains, with San Francisco just south of us for when we get the urge to go "urban." 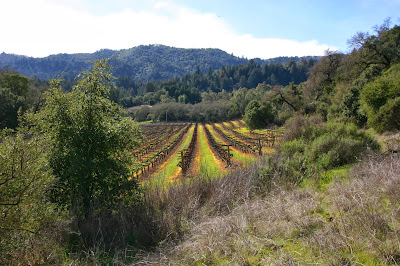 The rolling hills and vineyards of Sonoma County. 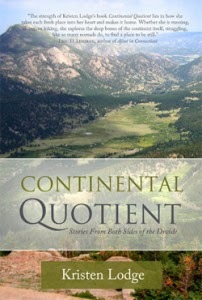 I've been reading a new book by fellow blogger Kristen Lodge (kristenlodge.blogspot.com) entitled "Continental Quotient." 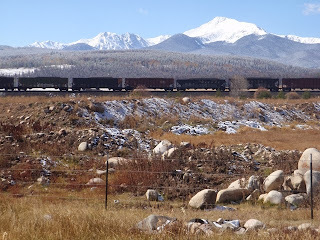 It's a series of vignettes about her experiences as she moved west from New Hampshire, finally ending up in Tucson after having lived in Maine, Vermont and Colorado. She was chasing the dream of living in an Albert Bierstadt landscape; not literally, just one filled with mountains, streams and forests as were depicted in some of his famous works. I can understand that dream completely; that's why we camp in Yosemite and make multiple trips to the Sierras every year. I knew we were lucky to be so close to places like that, but I never really thought about it much until I read her book. What really stood out for me though, was her willingness to move. At first it was a job offer that brought her to a ski town in Maine. That led to a ski town (and a ski boyfriend) in Vermont, which led to a yearning for higher mountains and more snow in Colorado. It's not that she didn't have a family--her parents and sister still live on the east coast--she just picked up and moved when she felt the desire. That is an elusive concept for me. I admire the bravery of Kristen's journey; to follow a dream and move to a place where no one knows you, away from family and everything that's familiar. Then to continue moving farther and farther away, to a part of the country you've only read about, the other side of the continental divide. That takes guts and an adventurous spirit. It's funny, but I don't recall ever reading about someone's yearning to move east. I've known a few people who have gone east, but they've always made their way back to the west coast after a few years. In all the books I've read, going west seems to be the direction of choice. It's embedded in our history; west equates to open range, cowboy freedom and a new way of life. From Lewis and Clark to the Gold Rush to that weekend in Las Vegas, people have always been and are still drawn west. Sometimes as I'm driving to work in that half-awake Monday stupor I'll look around and wonder where all the people have come from. I grew up surrounded by open fields and rolling grassy hills. The building boom started in the 80's here: my first real job after college was in a new office park in the middle of what had been a cow pasture when I moved away to college. Today the city has expanded to encompass the old airfield that was used for training during WWII (at one time far to the west of city limits.) There are 100,000 more people here in my "little" town than when I was born. That's a lot of moving west. About as far west as we can go: the sun sets over the Pacific Ocean, Sonoma Coast. When we travel, usually driving, our camper is our home base. Even in the most desolate surroundings we can climb in and have our familiar comforts: the sleeping bags we've used since before we were married, the pots and pans that have cooked our meals for 25 years. It's our home in the sense of a place to sleep and eat and be safe. I guess in that way we never really leave home. For us, moving west would not even require leaving the county. 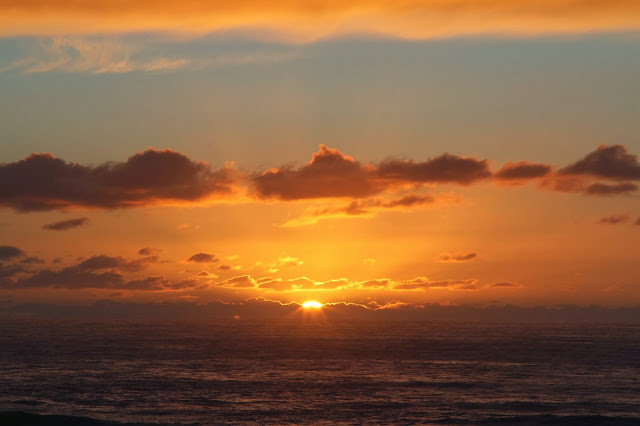 We are twenty miles east of the Pacific Ocean, and considering Mark's propensity for seasickness, living on a boat is not an option. So here we stay, within a few minutes drive from our closest relatives, the people that matter the most to us. We will always have the urge to see new places and travel farther afield, but when it comes down to sharing overly rich foods, drinking too much wine and sleeping in, we will always be drawn back here: our camper away from the camper, our home. From our home to yours: Happy Thanksgiving everyone.